Christodoulides said it was a “very important development” that UN Secretary-General António Guterres had decided to send a representative, Jane Holl Lute, to visit all parties. Holl Lute will start her tour with a visit to Cyprus on 23 July, where she will meet President Nicos Anastasiades. Christodoulides, who was appointed as foreign minister last March, is a familiar face in Brussels, where he served as a diplomat and spokesperson to the Cypriot Presidency in 2012, before becoming the spokesperson of President Anastasiades. He was speaking in Brussels at an event organised by the Transatlantic Institute. The eastern Mediterranean island has been divided since 1974, when Turkish troops invaded it in response to an Athens-inspired coup seeking union with Greece. 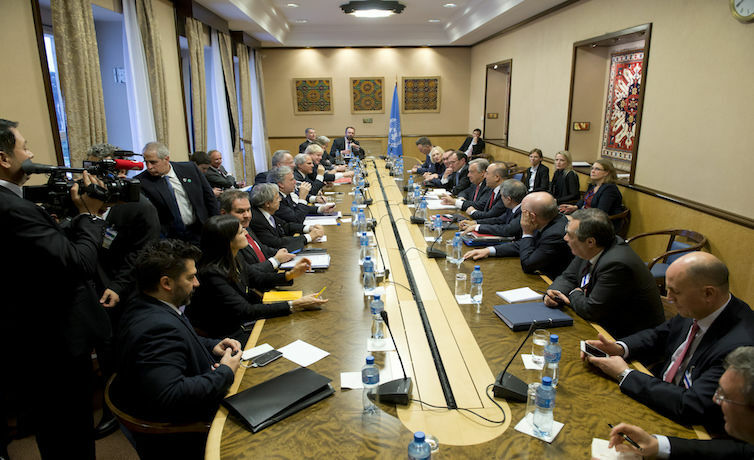 UN-led talks to resolve the decades-old division of Cyprus ended without agreement last January. The Cypriot minister said that this attempt had been “the closest to a solution” since 1976. For the first time “the essence” of the Cyprus problem had been discussed, he said, on the questions of security and guarantees. The parties are trying to reach a security deal on the presence of Turkish forces on the island in tandem with political negotiations on a comprehensive federal settlement sought by islanders. The UN Secretary General Antonio Guterres has assigned Jane Holl Lute to conduct consultations with all parties of the Conference on Cyprus. A seasoned diplomat and former US deputy secretary of Homeland Security, Lute is expected to follow in the footsteps of Espen Barth Eide, a Norwegian politician, who was the latest go-between for the two Cypriot leaders and the UN until the talks collapsed in July 2017. The Cypriot minister said that after Nicosia, Lute will visit Turkey, Greece, the UK and the EU, in order to explore the possibility for the resumption of talks. Turkey, Greece and the UK are “guarantors” of the UN-led Cyprus reunification process. “Our clear political approach is that the current status quo cannot be the solution of the Cyprus problem”, he said, adding: “We want more than anybody else the solution of the Cyprus problem and we hope that this effort by Ms Lute will lead to the resumption of talks”. The Cypriot minister said Cyprus wanted Turkey to come closer to the European Union, as a way to help solve the Cyprus problem but added that it was for Ankara to take the first step. The last round of talks saw the EU involved for the first time, Christodoulides pointed out, including the Geneva conference last June, where the EU was represented by Commission President Jean-Claude Juncker. While Cyprus has been an EU member since 2004, the internationally recognised government in Nicosia exercises no control over the northern, Turkish-ruled part of the island, and EU legislation is suspended there until a settlement is reached. “We want, and we encourage the EU involvement in the Cyprus problem. At the end of the day, it is an EU problem”, he said. Last November, Juncker said the conference that ended unsuccessfully two months later was “the very last chance to see the island reunited”. The Cypriot minister said that Anastasiades had proposed the return of the city of Famagusta to the UN and to its lawful inhabitants, which he indicated could impact Nicosia’s position on opening certain chapters in Turkey’s EU accession process. Turkey does not recognise the government of Cyprus and Nicosia has blocked six key chapters of Ankara’s negotiations for EU membership since 2009, effectively halting the process. The minister also referred to Varosha, an abandoned southern quarter of Famagusta. Prior to the Turkish invasion, it was a modern tourist area of the city. Its inhabitants fled when it came under Turkish control, and it has remained abandoned and under the occupation of the Turkish Armed Forces ever since. As of 2018, the district continues to be uninhabited and public access is forbidden. Asked what lesson Cyprus had drawn from the last failed negotiations, he said his country would need to be better prepared for the next international conference than it was last time. Nicosia cannot afford “the luxury of another failure,” he added. 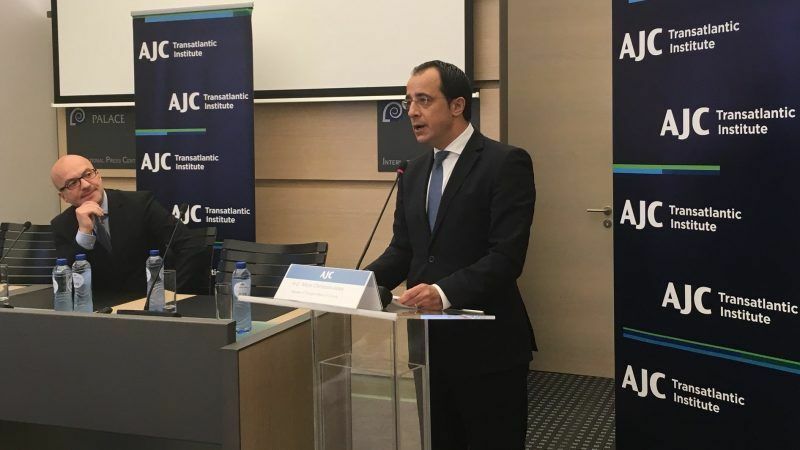 Chritodoulides informed the audience that his country had worked with Greece, and others in the region, such as Israel, Egypt, Jordan, Lebanon and the Palestinians in creating trilateral cooperation mechanisms. He said that the trilateral mechanisms were “arguably one of the most successful additions to Cyprus’s foreign policy footprint”. To date, he said five Summits with Egypt in this format had been held, four with Israel, the inaugural Summit with Jordan was held in Nicosia in January, and preparations were underway for Summits with Lebanon and Palestine. Currently, preparations were under way for a trilateral between Cyprus, Greece and Egypt in Crete, and in December with Israel at Beersheba, Israel’s Silicon Valley. The Cypriot minister said the trilateral cooperation was not exclusive, nor was it directed against any third country. He said the benefits from these regional developments bear fruits not only for the countries in the region, but also for the European Union. “The Union must seize the moment and reap these benefits. As I have mentioned recent crises that have emerged for the Union – such as migration – go back to these region, and solutions can only stem if the Union not only looks inwards but also outwards”, Christodoulides said. The EU should shoe more interest for the Eastern Mediterranean, the minister insisted.